Slow Cooker Pork Shoulder Steaks with Mushrooms, Potatoes and Gravy–Pork steaks are browned and then slowly cooked until tender. 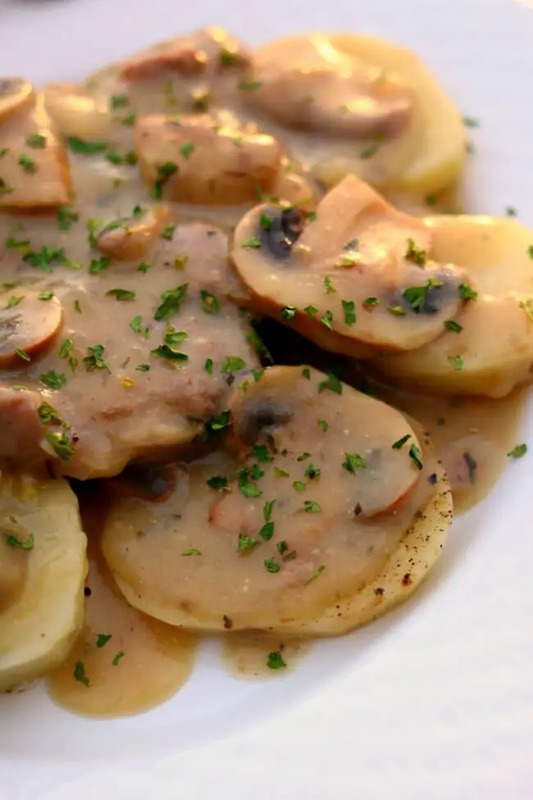 They are served alongside a mushroom gravy and sliced potatoes. A good old fashioned dinner! Get the INSTANT POT version of the recipe. This meal is so delicious it could even be your Valentine’s dinner! Serve alongside a salad and you’ve got a fancy and delicious meal that doesn’t take that much effort. Pork shoulder in general is made for the slow cooker. It really benefits from the moist heat and gets ultra tender. Pork shoulder steaks are also known as blade chops, blade steaks, blade-end pork loin chops, pork loin blade chops, pork shoulder steaks, pork shoulder blade steaks and pork steaks. So if you want to make this meal you can look for anything in the meat section of the grocery store that has one of those names on it. Pork shoulder steaks have LOTS of flavor but they need to be braised to get tender and break down the connective tissue. Which is why the slow cooker works so well for this particular cut of meat. The bonus to using pork steaks is that they are cheap! 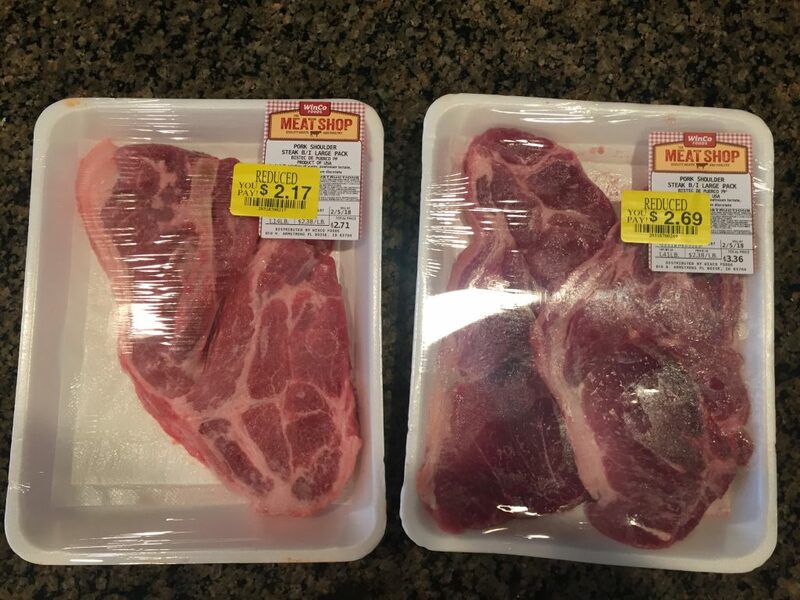 I got 2 1/2 pounds of meat for less than $5.00 at Winco. These were bone-in steaks which adds to the poundage but I also felt like the bone-in meat has more flavor than boneless meat. Generally there is a thick ribbon of fat on the outside of the meat. I just used a sharp knife and trimmed the excess fat off. 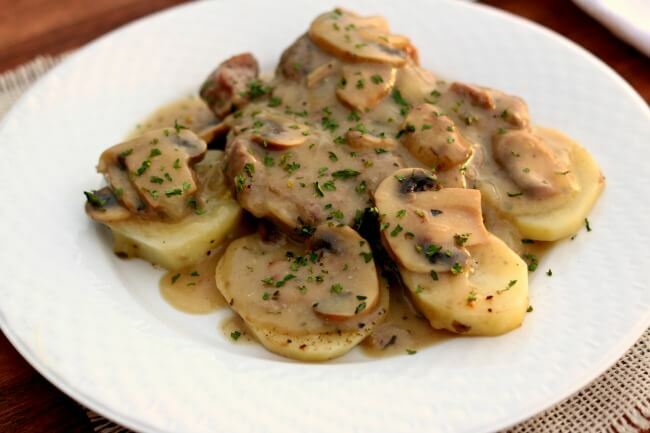 Try Slow Cooker Pork Shoulder Steaks with Mushrooms, Potatoes and Gravy for dinner this week! To make Slow Cooker Pork Shoulder Steaks with Mushrooms, Potatoes and Gravy I used my 6 quart oval Kitchenaid slow cooker. * I love this slow cooker (you can see me talking about it in a video here). It cooks low and evenly. I love the medium heat choice because most slow cookers that I’ve seen only have the option of cooking on low or high. If you’re going to buy just one slow cooker, this is the one that I recommend. Pork steaks are browned and then slowly cooked until tender. 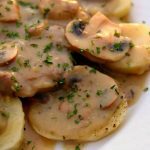 They are served alongside a mushroom gravy and sliced potatoes. A good old fashioned dinner! Trim your pork steaks of excess fat. Generously salt and pepper your pork steaks. Heat a large pan over medium heat on your stove top. Add in the oil and let it heat for a minute. Arrange each of the pork steaks on the bottom of the pan so they are all in contact with the bottom of the pan (you may need to work in batches). Let the steaks brown for 5 minutes. Do not move the steaks or turn them over for the full 5 minutes. You’ll be tempted to move them or mess around with them, but don’t. While the meat is browning prepare your vegetables. Dice the onion, mince the garlic and peel the potatoes. Slice the potatoes into quarter inch rounds. Slice the mushrooms. When the 5 minutes is up remove the pork steaks and place them into the slow cooker. I only browned one side of the steaks for sake of time but if you want you can brown both sides. Add the onion into the hot pan and saute for 3 minutes. Add in the garlic and saute for 1 more minute. Pour the chicken broth in and deglaze the pan. Add the mixture into the slow cooker. Stir the mushrooms, mustard, lemon juice and tarragon into the slow cooker. Place the potatoes in a oven safe dish that will fit inside your slow cooker. You can use a pyrex,* corningware* or cake pan*. Salt and pepper the potatoes and toss. Cover the dish with foil. Lower the dish into the slow cooker on top of the pork. Carefully remove the dish of potatoes and set aside. Pour the half and half into the sauce. Turn the slow cooker to the high setting. Stir 3 Tbsp of cornstarch and 3 Tbsp of cold water together in a small bowl until smooth. Stir the cornstarch slurry into the pot and let the sauce thicken without the lid for about 30 minutes. Once sauce is thickened salt and pepper to taste. Serve sauce, mushrooms and pork over the top of the potatoes. If you don’t want the potatoes simply leave them out. The cooking time will remain the same. I sprinkled my pork with garlic salt and just wanted to remind people not to do that. I had forgotten that the garlic will get overdone and bitter while frying. Add Garlic later. I browned my pork shoulder steak on both sides to get the most flavour out of it. Set it aside in a clean pan. With the eat still on I deglazed my pan with a bit of chicken broth. Added my mushroom soup, mixed until creamy. Then added a little extra chicken broth so the meat has something to braze in. I didn’t understand the point of putting a pan of potatoes on the steaks if you are brazing them. And thought you would be pushing all the juices out of the steak. Probably works just fine but I decided to skip the potatoes and make them on the side. And at the same time I will reduce the mushroom soup to a nice consistency to put over my steak and potatoes. Lovely… I will have to try your actual recipe it lookse lovely. That’s why I said I came for the slow cooker instructions. How long to heat it etc. To make sure others understood it wasn’t her true recipe I was commenting on. I also prefer all home cooked food but don’t always have the time for it. By the way mine was done in 5 hours this time. Working on the gravy soon.